First of all, where to go? Cyclists are spoiled for choice in the Czech Republic, so it’s difficult to know where to begin. Upland areas such as Šumava National Park and the Jizera Mountains are probably best left until later in the season, but there are plenty of lower-lying options. The CZeCOT site gives a useful guide to each region for tourists. Once you’ve decided on the location, you’ll want to plan your route. 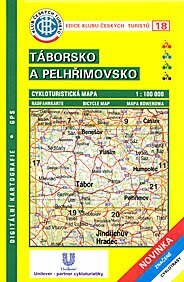 The first option is to buy a printed cycling map. All the main titles come with route suggestions either on the reverse side or in a separate booklet. Alternatively, you can look for suggestions on-line. Cykloserver and Czech brewer Radegast both offer cycle-route search engines. By specifying various criteria (region, bike type, distance, degree of difficulty, etc.) you can find a suitable route, print it out and take it with you. Cykloserver has the advantage of being available in English, but the Radegast site is easy enough to negotiate even for those with limited Czech. If you’re in Prague and don’t want to venture far outside the capital, Grant’s Prague Bike Blog has plenty of tips for rides in and around city. Another option for Prague is Prazskecyklostezky.cz (in Czech only). Before you go you might want to familiarise yourself with the Czech cycle-route signposting system. You can also consult the Cyclists Welcome website to find bike-friendly places to stay, eat and visit along the way. Now all you need to do is get there and get pedalling. You can take bikes on most Czech trains, but the system is difficult to fathom if you’re not used to it. Click here for a guide. Need a bicycle? You can hire trekking bikes from numerous railway stations around the country. Unfortunately the relevant link on the Czech Railways website is down, but I assume the scheme will be up and running again from 1 April this year. Rates last year were around 200 crowns a day plus a returnable deposit of 1,000 crowns (two pieces of ID also needed). I’d welcome any feedback from anyone who has tried this service.